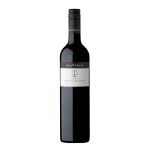 A blend of both Coonawarra and McLaren Vale fruit. The nose is framed by blackberry but enjoys leather and tobacco notes from time in bottle and a vanillin note from oak; faint olive and menthol provide background complexity. The wine is in a good place with tannins melding with leathery fruit and a taut line of acidity keeping things together. There is a mocha note to the mid palate and the wine is driven home by acidity that is laced by bracken and a touch of tomato leaf. In a good spot now and will reward a few more years yet.